Uses the iPod battery - no need to spend money on AAAs! 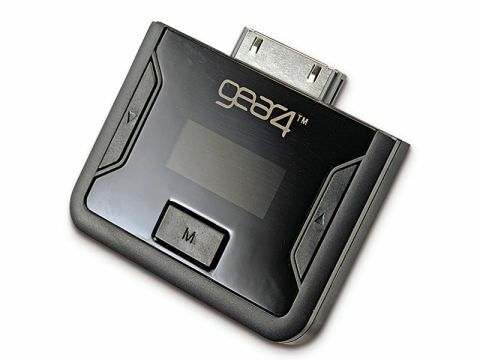 This FM transmitter is an update to Gear4's previous Airzone transmitter. It's kept its low price and has done away with the need for an AAA battery, running instead on the iPod's power. Unfortunately a charging cable doesn't come in the box, but one is available as an optional extra. The signal strength and ease of tuning were both acceptable. You get four preset channels, down from six on its predecessor, but a better LED display. Critically, the dial moves in increments of 0.1MHz so you can get a precise frequency. It will also broadcast a signal on any frequency from 87.6 to 107.9, which means you can avoid radio station chatter by tuning the signal below the UK's 88.1 FM radio spectrum starting point, if you car or home stereo allows. You can also beam the iPod signal to your hi-fi, thereby turning the iPod into a remote. Build quality could be improved but generally we liked it.